The year 2015 turned to be one of the gloomiest for the mainstream industrial community. Surprisingly, the same year however happened to be one of the most encouraging for industries requiring low number of labour force, simple technology and technicalities, moderate investment and smaller amount of energy. Despite the deteriorating investment climate in the country especially for the mainstream big business ventures, an encouraging boost has been witnessed in the segment of micro, small and medium enterprises (MSMEs) in recent years transferring the hope of some relief to the overall national economy. It illuminates how the country is failing to retain business firms or how has micro, small and medium enterprises (MSMEs) been the latest next ‘first-priority‘ of investors. Numbers of MSMEs have shot up sharply in the last decade as the sector grew by 475 percent from the fiscal 2006-07 to 2015-16, according to the Department of Cottage and Small Industries (DCSI). The Department data positively illuminates that altogether 400,000 firms have been registered under various business segments, among others, manufacturing, agro and forestry, mineral, tourism, service, construction and energy based industries during the decade in review. Total number of those MSMEs remained at only 69,431 till fiscal 2005-06. Cottage and Small Industry Offices (CSIOs) under DCSI in each 75 districts registers business firms having fixed capital worth Rs 100,000 to Rs 30 million. Narayan Prasad Bidari, Director General of DCSI said that 80 percent of the industries registered in the DCSI during the period committed fixed capital worth Rs 300,000 to Rs 600,000. The year 2015 turned to be one of the gloomiest for the mainstream industrial community. Surprisingly, the same year however, happened to be one of the most encouraging for industries requiring low number of labour force, simple technology and technicalities, moderate investment and smaller amount of energy. Government statistics show that MSMEs expanded encouragingly in current fiscal despite unfavorable economic situation â€“ adverse impacts of earthquake and four month long supply line disruptions due to protest at border points. According to the Office of Company Registrar (OCR), exceeding the last fiscal‘s record a total of 13,537 companies were registered in the first 11 months of the current fiscal. The data obtained from CSIO Kathmandu also shows encouraging trend in the sector of cottage and small enterprises which shows that a total of 596 companies (private limited) have been registered in the first 10 months of this fiscal as compared to the 473 during the same period of the last fiscal. In CSIO Kathmandu, a total of 2,528 firms including individual and partnership firms and companies (private limited) are registered in first 10 months against 3,090 of the entire period in last fiscal 2014-15. Arun Pokharel, Chief of the CSIO Kathmandu opines that the growth of MSMEs will contribute to the enhancement of productive sector and overall economy in the future. Rapid expansion of MSMEs in the last decade is largely contributed by foreign returnee migrants who have brought in skills, capital and the spirit to do something. A study commissioned by Ankur Nepal, a non-governmental organisation a year ago, in 15 districts revealed that 80 percent of South Korea returnees have chosen entrepreneurship. On the other hand, some youths who returned from Israel have started modern agriculture (vegetable) farming at Ramkot of Kathmandu district. Chhimeki Mart of Ramhiti, Bouddha also can be taken as an example of migrant worker enterprise. Initiated in 2012 the Chhimmeki Mart expanded another outlet in Saraswati Nagar of Chabahil. Another example is Minitin Cafe in Lazimpat, which was initiated by South Korea returnee migrants as a joint investment South Korean venture. These are some examples of ventures initiated by migrant returnees in Kathmandu while there are more ventures in other districts as well. Enterprise development has been growing massively across the country as the number of returnee migrants has been increasing. “Migration of youth for overseas jobs is subsequently bringing entrepreneurial skill, capital and technical know-how into the country which is playing a pivotal role in enterprise development,â€ comments Senior Economist Keshav Acharya. Blaming factors like ‘unprofessional‘ trade unionism, weak investment climate, policy instability, power crunch, low competitive advantage and higher cost of production among others, investors, both new and old, have been opting for small enterprises. Industry players, according to them, have found such businesses predictable and the risk worth-taking. Many industrialists were forced to pull down shutters due to the deteriorating industrial environment in the country caused by political instability, frequent strike and bandhs, labour unrest, increasing load shedding in the last decade which increased the cost of production manifolds. On the other hand, pre-matured deindustrialisation in the country along with accession to the World Trade Organisation (WTO) in 2004 fostered the government to promote MSMEs to address supply side constraints. Many big-scale industries were shut down after they failed to compete with cheaper imported products as the Nepali market was opened for goods and services of exporting countries. It is definite that degrading industrial environment has adverse impact on other segments of the economy. However, MSMEs, which could come in existence with minimum resources â€“ capital, labour among others as compared to big enterprises were less affected. MSMEs were not as affected as big industries due to the recent shocks the economy went through as compared to big industries. After the industrial environment was hit hard due to political instability, labour unrest, increased load shedding and other reasons, the government‘s Trade Policy and Industrial Enterprises Act both laid higher emphasis on MSMEs to address supply side constraints. The trade policy focused on products and services of comparative and competitive advantage and talked about channelising government support in value chain development of such products and services. The trade policy has envisioned inclusive development as well as poverty alleviation which support the development of MSMEs across the country. The Industrial Enterprises Act has also offered various incentives for MSMEs in registration and renewal fees and tax incentives in purchase of machinery and equipment for industries. Similarly, there is provision of value added tax (VAT) refund which was levied on import of raw material after exporting goods among others. Furthermore incentives are announced through law for the industries established in remote parts of the country. Not only the government, but also many development partners have been supporting entrepreneurship development, especially of the small scale. Dr Laxman Pun, National Programme Manager of Micro-Enterprise Development Programme (MEDEP), the project being implemented jointly by the Nepal Government and UNDP, says that around 70 percent women are running micro, small enterprises. MEDEP has not only been supporting to boost production but also empowering women, according to him. Stakeholders believe that the biggest strength of the MSMEs is that they do not only empower people financially, but also give a sense of dignity especially to women and marginalized groups. It‘s not that the MSMEs are free of problems. They are subject to shocks of various sorts. But the biggest strength for them is faster recovery when compared to big businesses. MSMEs in the country also suffered the earthquake and the unofficial embargo. Himalayan DÃ©cor Rugs owned by Shobha Gurung, Vice President of Federation of Nepal Cottage and Small Industries (FNCSI) shares that her factory located in Gongabu collapsed and all the machineries and production stored in the factory were destroyed. Almost a year later, Gurung relocated her factory to Tinkune and is slowly recovering operations. 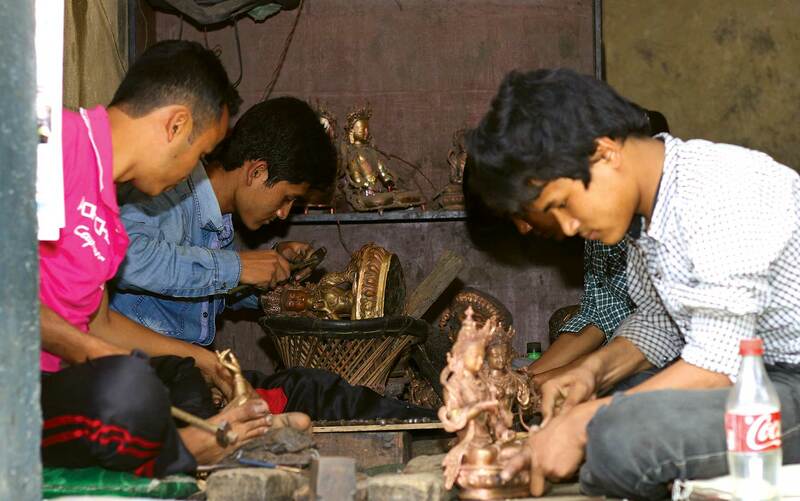 Even though a number of big businesses are still struggling to make it through the impact of the earthquake, small businesses like those of Gurung have mostly resumed normal operations. According to stakeholders and industry players, the beauty of MSMEs is the simplicity associated with it. These account for the uncomplicated technical and technological know-how, minimum labour cost, economic set up and lower production cost, less reliance on imported raw materials, utilisation of locally available resources and normal production house. MSMEs are a vital component of the country‘s economy as they play an enormous role in stimulating the country‘s economy contributing over 22 percent to it and generating around 1.75 million jobs at present. The government has also recently announced Rs one billion‘s challenge fund through the fiscal budget 2016-17 to provide venture capital to people with innovative ideas. Experts believe that this will support enterprise development if implemented. Senior Economist Bishwambher Pyakurel asserted that the government has not been paying attention to the MSMEs under the false notion that the big businesses alone would salvage the national economy. “Small industries of manufacturing segment do have 80 percent of the value addition of Nepali products while such industries already have as much as 7.5 percent contribution in the GDP,â€ he says, “If the government would ensure to link them with international products and facilitate them in appropriate manner, their contribution in economic development would be gigantic.â€ Stating that such MSMEs help in self-employment, appropriate mobilisation of resources and stir the rural economy he also claimed such industries have two third of the share in total national industrial output. He calls for government intervention in the development of the economy through the development of MSMEs.